I have some extra gun cart wheels I'd like to sell. They're 12" diameter and fit a standard 1/2" axle. Best part is the tires are made of EVA foam so they have some cushion like a pneumatic but are 100% flat free and impervious to goat head. $60 per pair shipped or $45 per pair face to face. OD of rim or OD of tire,never mind I just saw the ruler. 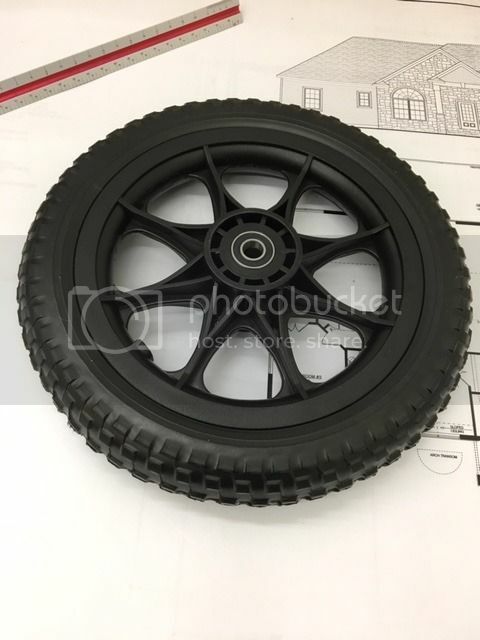 These are the nicest wheels I have found. They're very durable, yet light weight and have a good axle bearing. Send the cash to Michigan Slim at Paradise Pass. Etna Green, Indiana. I promise I'll think about giving it to him. Really. Honest. I have a few left. I will take a pair.PM sent for address. Did you get the gold yet? I still have a few pair of these wheels for sale. They are great.I like them very much. will they fit a rugged gear cart?